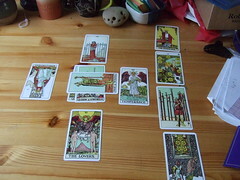 The most popular version of the Tarot was established in 1910 by the artist Pamela Colman-Smith. She worked under the guidance of occultist A.E. Waite. The Waite deck was the first tarot deck to include symbolic imagery on all 78 cards. The Minor Arcana, or Pip cards, are the numbered cards (1-10) that comprise each suit. The Minor Arcana reflect day to day issues. They can represent how you interact with people, your work, your emotions, your finances, and your personal relationships. In a tarot card reading, the minor arcana reveal the who’s, how’s, and what’s. There is no sense of permanence. If there are a number of minor arcana suit cards in your spread, know that you can make changes, work through blocks, and understands where you are emotionally. The tarot’s power lies in its ability to distinguish a person’s path through the psychic ability or intuition of the tarot reader. In some cases, a psychic tarot reader will rely primarily on their own psychic abilities to interpret the cards, while a non-psychic tarot reader will rely more on the tarot card meanings themselves. Either way, trust the cards can do their job and ask a lot of questions. Carolyn Naiman is a professional Tarot reader and the Webmaster of http://tarotreadingpsychic.com She has a Masters in Psychoology and has been a Tarot advisor since 1998.